Law at the End of the Day: Reflections on Zhou Ruijin, "Reflections on the Cultural Revolution: A Ten Thousand Character Petition"--Flora Sapio, Jean Mittelstaedt and Larry Catá Backer. Reflections on Zhou Ruijin, "Reflections on the Cultural Revolution: A Ten Thousand Character Petition"--Flora Sapio, Jean Mittelstaedt and Larry Catá Backer. The Cultural Revolution clearly demonstrates just how bad the political life of a country can become if there is no democracy, no rule of law and power is not subject to constraint. 2016 is a special year: it is the fiftieth anniversary of the start of the historically unprecedented Great Proletarian Cultural Revolution and the fortieth anniversary of the end of the Cultural Revolution. Ten years of the Cultural Revolution that began fifty years ago was a terrible disaster for both the Chinese state and the Chinese nation. The ending forty years ago of the Cultural Revolution made possible the reform and opening that followed. This in turn made possible the China of today. Therefore, when we speak about reform, we cannot avoid discussing the Cultural Revolution. Not only is it unavoidable but it is inseparable from any discussion of reform. The end of the Cultural Revolution essentially put an end to the class struggle that had divided Chinese society. For a long period following the end of the Cultural Revolution there was a broad consensus in Chinese society against the Cultural Revolution – kind of like the greatest common factor in arithmetic. Further deepening of reform was a quest for the greatest common denominator. But was the Cultural Revolution actually rejected in its entirety? To get at that question we must ask if society made a deep and thorough reflection upon the nature of the Cultural Revolution itself. Absent a deep examination of the nature of the Cultural Revolution, it cannot be rejected in its entirety. Reflection on some aspects of the Cultural Revolution was avoided. There always arose the question of how to reject it and to just what degree to reject it. The differing views on the Cultural Revolution that we have been hearing in recent years reflect that. For some time after the end of the Cultural Revolution, reflections upon the Cultural Revolution on one hand made the “Gang of Four” the focus of all criticism. All hatred was focused on them and all the dirty water was splashed on their faces. Most people thought that Chairman Mao meant well when he started the Cultural Revolution but the plotting of the “Gang of Four” diverted it from its proper course and lead to serious mistakes. A member of the audience, the Taiwan historian Professor Wang Rongzu 王荣祖could not contain himself and asked, “If a mother hits her child for a long time is she still a loving mother? If this woman is so cruel, how can she expect the abused child to be loyal to her? For a mother to treat her child this way is illegal in all civilized countries and is punishable by law.” After this, Qu Xiao’s positive propaganda became a negative and he had to break off his speaking schedule and hurriedly leave the USA. After returning to China, he became seriously ill, made no more public appearances and slowly faded from view. This example shows how very superficial reflections on the Cultural Revolution have been. Criticisms of the Cultural Revolution have been confined to specific events. Only very has the fundamental nature of the Cultural Revolution ever been addressed. After the resolution made at the Sixth Plenary Session of the Eleventh Congress of the Communist Party of China, most people believed that the Cultural Revolution’s ten years of chaos was the result of extreme leftist ideology. For them, the lesson of the Cultural Revolution was that China should concentrate on building the economy and greatly strengthen the productive capacity of society. China should strengthen democracy and the construction of the legal system so that the country would be ruled according to the law. Marx said several times that once that often only when a thing develops to its classic or final state (including their extreme state) does it become possible to understand the stages of development and essential nature of a thing. Similarly, the Cultural Revolution enables us to recognize the extremely serious harm done by a dictatorship. The primary cause of the Cultural Revolution was an intense personality cult in a dictatorship. The next most important cause was the ideology of class struggle. The combination of these two created a severe breakdown of rule according to law and led to total anarchy. The Cultural Revolution was not an isolated event. Its occurrence and development did not come out of nowhere. They are rather the necessary consequence of a series of errors. During the Cultural Revolution, Mao Zedong became the embodiment of Truth. His words were “One word of Chairman Mao counts for more than ten thousand words from someone else”. Mao’s personality cult developed to an extreme. The rise of this cult of personality can be traced back to the Yan’an period. 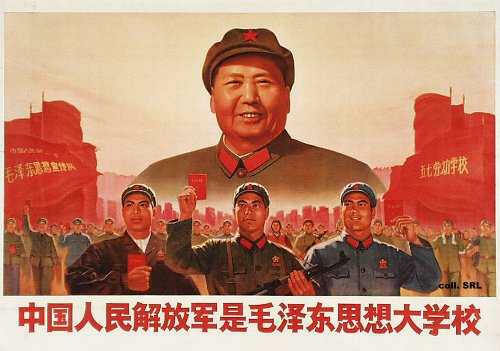 During this period the cult of personality and dictatorial style of Mao Zedong arose. After the founding of the PRC, it became more intense, finally leading to extreme leftism and the outbreak of the Cultural Revolution. The root of the calamity that became the Great Famine was the campaign that ran from 1957 through the first half of 1958 to “Oppose ‘Oppose Rashness’” 反‘反冒进’. “Oppose Rashness” was a resolution adopted by a majority of the Chinese Communist Party Central Committee after the Eighth Congress of the Communist Party of 1956 – 57. The “Oppose ‘Oppose Rashness’” campaign disrupted economic planning and preparations, led to Mao over-riding the Politburo of the Communist Party, made Mao authoritative, establishing the practice in the top level of the Party of flattering Mao. After the Second Session of the Eighth Congress of the Communist Party of China, Zhou said: “Mao is the representative of Truth. The Great Leap Forward is the direct result of the “Oppose ‘Oppose Rashness’” campaign. The process from the “Oppose ‘Oppose Rashness’” to the Cultural Revolution is in essence the story of internal struggles within the Communist Party. This is a disaster brought on by the Communist Party. Mao governed China for 27 years. During his rule there took place the three years of the Korean War, the five years of the Great Famine, the ten years of the Cultural Revolution. During these 27 years, there were 18 years of war, famine and chaos. The remaining nine years were punctuated by incessant campaigns from Land Reform to the Four Cleanups 四清 [Translator’s Note: 1962 campaign to cleanup politics, cleanup the economy, clean up organizations and clean up ideology. 清政治，清经济，清组织，清思想]. People were buffeted by campaigns large and small without let up. Although all this created unprecedented hardships for the Chinese people, Mao always said that he was doing this for China’s 600 million people, for the Chinese revolution and for world revolution. Lin Biao’s personal evaluation of Mao was that “Mao believed himself to be the representative of the people and saw himself as the authority on the people”. How is it that Mao Zedong’s political thought became essentially the core ideology of the Communist Party? How is it that an extreme leftist erroneous line came to predominate? The most important factor is a personality cult that grew up over a long period so that Mao acquired indisputable dominance, a dominance that meant that one word from Mao could mean life or death. This developed later into “One word from Mao counts for more than Ten Thousand words from another” Mao himself became the embodiment of Truth. Nobody inside or outside of the Party could oppose him. The real explanation of how the Cultural Revolution came to be is that if there is no democracy, no rule of law and power is not constrained, than there are no limits to just how false the political life of a country can become. Personality cults are fundamentally a manifestation of dictatorship. What is the difference between saying that someone is the Great Red Sun and saying that the Emperor is the Son of Heaven? Cheap applause, however loudly the tide resounds at the time, in no way represents the will of the people. In the end it cannot escape the ridicule of history. We should be alert to the danger of personality cults. This is no more and no less than being alert to the danger of dictatorship. Nearly all socialist countries in practice have suffered from the overcentralization of power. Some, such as the Soviet Union and the Eastern European countries, had one-man dictatorships. They suffered from political pathologies such as big purges and large scale repression. The Cultural Revolution in China greatly harmed the image of socialism. After the Cultural Revolution had ended, the Communist Party of China came to recognize the harm that personality cults and continuing the class struggle had done. The Party called for focusing on economic construction and for China to prioritize reform and opening. This was a correction to the chaos of the Cultural Revolution. This was an historic change of course. As a result, Chinese society was united as never before and industry flourished. People realized that they had been like the people in the old proverb, “A broken bowl too can be filled with water”: meaning that people should not be so handicapped with old ways of thinking that they are not open to other perspectives. Now people had hope that their lives would improve. Class struggle was the Cultural Revolution’s key ideological foundation and runs as a thread through the entire period. The momentum of a long period of class struggle and misunderstandings about socialism caused by the influence of traditional ideas created distorted perceptions that differing views within the Party were a struggle between competing lines and a kind of class struggle. This finally led to the outbreak of the Cultural Revolution. During the Cultural Revolution, people were categorized into different groups and then treated according to class struggle thinking. People were placed into groups such as capitalist roaders, evil-doers [牛鬼蛇神], traitors, betrayers, Royalists, landlords, rich peasants, counter-revolutionaries, bad elements, rightists, saboteurs and thieves, counter revolutionary elements within the May 16 Red Guard faction, intellectuals, dictatorship imposed on artists, dictatorship imposed upon teachers, criticism of people who would rehabilitate rightists. The labels differ but all involve being hauled before a group and being stigmatized as a class enemy. Anyone put in these categories cannot avoid suffering attacks and troubles of various degrees. From late 1966, society split into two factions, the “Conservative Faction” and the “Rebel Faction”. Both factions claimed to be “Loyal defenders of Mao Zedong Thought” and that the other faction are class enemies who “Oppose the Party, Oppose Socialism and Oppose Mao Zedong Thought”. Whenever one faction gained the upper hand, the other side would rush to severely punish the other. Whenever I heard that someone should be rectified, I do my utmost to rectify them! All these people should be rectified, if you don’t do it, you are a bad person. If people are rectified by someone who belongs to another group, the rectified one is still one of our own. Take a close look at the rectified; they also rectify other people! These words express exhaustion, helplessness, and black humor. In this song you can see the cruelty of the struggle sessions of those days and who everyone felt terrorized. During the Cultural Revolution, today’s revolutionaries may become tomorrow’s counter-revolutionaries. The roles of struggler and struggled can switch from one moment to the next. Everyone was on edge. On June 10, 1966, when Mao Zedong met Vietnam State Chairman Ho Chi Minh, he said, “In this movement we’ll rectify a few hundred or a few thousand people, especially academics, teachers, journalists, publishers, artists, the universities, middle schools and primary schools.” He listed the principal targets of the movement but sharply circumscribed its scope. Finally the number of people rectified was not just several hundreds or thousands of people. Millions and tens of millions of people were rectified. After the Cultural Revolution had ended, the old author Ye Shengtao 叶圣陶 wrote an article in People’s Daily “Those ten disastrous years killed about one hundred of my friends and acquaintances. The author Qin Mu 秦牧said, “Although I don’t have a very wide circle of acquaintances, but I made a count and among closer acquaintances about 27 were killed during those years. From there I might extrapolate that across the entire country there must have been a great number killed. This was unprecedented devastation. How many millions of people suffered severe hardships, how many millions will carry their resentments to their graves, how many homes were shattered, how many children wandered homelessly, how many books were consigned to the bonfire, how many historic sites were devastated, how many graves of worthy people of the past were dug up and desecrated, how many crimes were committed in the name of the Revolution? How many people died as a result of the Cultural Revolution? There are many views on this and no settled answer. On December 13, 1978 Ye Jianying at the closing ceremony of the Central Committee Work Conference said, “During the Cultural Revolution 100 million people were rectified and over 20 million died.” In 1980, Deng Xiaoping said to the Italian journalist Oriana Fallaci, “We’ll never know because people died of so many different causes and China is so very large. We can only say that very many died.” The figures given in the “Facts on the Various Movements since the Founding of the PRC” gives these figures: over 1,728,000 dead, 135,000 people executed for counter-revolutionary crimes, over 237,000 killed in armed struggles, 7.03 million handicapped, and over 71,200 homes destroyed. We can say that the coming of the Cultural Revolution was a sign that China’s millennia long rule of man era had begun to lose its moral baselines and that humane restraints. During the decade of the Cultural Revolution, 100 million people made false accusations against one another. Such a large number of nonsensical criminal accusations and such naked barbarity and slaughter has rarely been seen in human history. The document “Concerning the Resolution on Certain Questions on the History of the Communist Party Since the Founding of the PRC” 《关于建国以来党的若干历史问题的决议》 analyzed mistaken thinking about the use of class struggle thinking continuing during the period of socialism. “Owing to the historical characteristics of our Party, after the socialist transformation had been basically completed, our leaders in observing and handling the political, economic, cultural and other issues that arose during the development of socialism easily made the mistake of applying class struggle thinking to issues to which class struggle no longer applied. Moreover, when faced with class struggle under the new conditions, they applied the old methods of violent mass movements to which they had become accustomed even though this was no longer appropriate. This led to a serious widening of the use of class struggle.” Here, the “Resolution” clearly indicates that operating according to the methods used to fight the enemy during the revolutionary era leads must lead to great widening of the class struggle. In a way, the “Great Proletarian Cultural Revolution” used means of struggle that were meant to be used against an enemy. Party leaders had forgotten that a different kind of contradiction was involved. The result was that disagreements within the Party were exaggerated into class struggles. During the law revisions of 1997 the crime of counter-revolution was abolished. The crime of harming national security, which replaced it, manifested an approach consistent with a common sense approach to the state authority. Law as the manifestation of the governing class cannot permit “revolutionary” behavior such as harming national sovereignty, territorial integrity and security, dividing the country, armed violence, overthrow of state power or overthrowing state institutions. The fundamental error of the theory of continuing revolution under the dictatorship of the proletariat is the misconception that the capitalist class will continue to exist after the establishment of the socialist system. Moreover, this also assumed that class opposition and class struggle would continue in society and so a great political revolution would be needed in which one class would overthrow another. This is classic thinking about conflict with an enemy. This erroneous extension of class opposition and class struggle to socialist society had serious consequences. Many things were criticized during the Cultural Revolution as being revisionist or capitalist. Many of these are Marxist fundamentals and socialist principles including many that Mao Zedong himself had advocated or supported. “If we do not have unity and stability then we have nothing”; “We have been suffering hardships for ten years. If disorders continue, people will not be able to stand it and they will not accept it.” The unity and stability that Deng Xiaoping talked about is the ‘bringing order out of chaos’ caused by class struggle theory and expressing a fervent hope for economic construction. After the Cultural Revolution, China gradually opened up. Chinese discovered that while China had been preoccupied with its ferocious political movements, other countries had concentrated on developing their national economies. Some countries and regions, such as the “Four Little Dragons” of Asia had already begun their economic take-offs. China had lost out on many development opportunities while it was doing political movements. The gap with the developed countries was growing. Deng Xiaoping is said to have thought “After the Second World, the countries aligned with the US have gotten rich while the countries aligned with the Soviet Union are poor. “ This may well have been something that average Chinese people were thinking but didn’t dare to say. Why are we called the People’s Republic of China? A republic is the goal: it replaced the dictatorial dynastic system and builds a new kind of country. Democratic politics is the logical foundation of newly established states in the modern era. The establishment of the first People’s Government of the People’s Republic of China was the result of a session of the first Political Consultative Congress. Under the historical conditions prevailing then, this expressed to a certain extent that “the power of the rulers comes from the consent of the governed”. This was a watershed event for China. What is a watershed event? In the words of Xu Youyu, it is the state replacing the dynasty. Dynastic politics should have ended there and Chinese history should have turned a page. The task of the new government should be to heal the wounds in society and to build institutions and the economy. But Mao Zedong didn’t do that. He still insisted that “class struggle is the guiding principle”. The Eighth Congress of the Communist Party of China opened in 1956. It determined that China’s general policies and political lines should be expanding democracy, strengthening the legal system, and concentrating on construction. However, the Party reversed course in 1957. The errors which developed in 1957 and afterwards arose, as people both inside and outside the Party knew at the time, because of opposing views within the Party about the right course for China. These divisions, however, did not prevent the development of “leftist” errors. Moreover, each time efforts were made to correct a “leftist” error, there was an opposing reaction and even stronger leftist impulse. Most of the Party leadership was forged during the era of bloody and intense revolution and maintained their outlook from those days and accordingly used the same old methods to solve problems. They had great difficulty restraining their egos, in giving up the traditional class struggle ways of thinking and revolutionary methods and instead come to recognize and understand the modern society. The era in which spiritual force and martial might confer legitimacy to a regime are over. The legitimacy of modern states does emerge from the barrel of a gun but can only come from hearts and minds of the people. Power is conferred by the people. That is what it is all about. The limitations to their understanding can be seen in their strong attachment to “ruling the state through the Party”. “All state decisions, orders and laws must be based on corresponding Party directives”. This results in a situation in which “the Party is higher than the state and occupies a position superior to the state”. The relationship between Party and the state have become distorted. This can very easily result in dictatorship and impede the progress of China towards a modern civilized society. What created this situation is related to the congenital defect in the initiation of the period of reform and opening itself. Professor Sun Liping 孙立平of Tsinghua University 清华大学 that reform began because of the confluence of several factors. The people demanded improved economic conditions while idealistic intellectuals called for change. Even more important, however, was the demand of people who had lost power during the Cultural Revolution get back in power. There were two types of people in this last group. Some wanted to set the clock back to 17 years before the Cultural Revolution began [Translator’s note: 1949, the year the PRC was founded] and while others wanted to take advantage of this turning point to create a new culture. The reforms of the early 1980s were run by this group. There were confident since they compared the early 80s with the years of chaos during the Cultural Revolution. This kind of confidence created the enlightenment of the 1980s. This enlightenment, however, concealed the shortcomings of reform – the reforms did not truly have the values and goals needed to move towards a new kind of civilization. Deepening reform means nothing less than replacing rule by the Party with rule by law. The difference between medieval and modern society, between barbarous society and civilized society is the difference between dictatorship and democracy. The difference is in the legitimacy of the source of power, in the legitimate uses of power, and in the legitimate transfer of power. Once legitimacy is accepted as a criterion, then social development occurs in a relatively controlled manner within certain defined parameters. This kind of certainty can spare people dealing with power from anxiety, uncertainty and fear and so give them liberty. Members of the Communist Party have fought, from the very beginning, for the sake of freedom and democracy, for the sake of putting an end to dictatorship and backwardness, for the sake of building civilization and an advanced modern country. We cannot therefore end up becoming the kind of people we originally opposed. From the instructions and speeches of Liu Shaoqi quoted above, we can see that he used class struggle thinking in his approach to the law and to the legal system. He clearly places the power of the Party and of the government above the law. Once we acknowledge that the power of the Party and of the government is above the law, and then the law is merely instrumental and is not about values. The law becomes optional. Clearly the way that people thought in those days was that the law was simply a tool of the ruler and cannot constrain power by putting it in a cage. This is probably the reason why that during the years prior to the Cultural Revolution almost nothing was done to build a legal system. Professor Zheng Yongnian has observed the phenomenon, but has not hit on the root problem. He came up with the opposite solution to corruption. He believes that there are not too many anti-corruption systems. For him, the key point is who is in charge. If corrupt officials are in charge, corruption will just go on as before. However I believe that this is the result of the state being ruled by the Party and the result of the system not being powerful. However, I do agree with something he says: he stresses the importance of people. A system created by honest people can be called an honest system while a system created by corrupt people can only be a corrupt system. However, even if the system is good, so long as the Party is greater than the law and power is greater than the law, it will be at best only window dressing. Consider for a moment how in the old days Mao Zedong as Party Chairman, holding high the Party charter, commanded attention with how Liu Shaoqi as PRC President when during the Cultural Revolution he held up the Constitution as a claim of authority. The difference between the two is like the distance between the heavens and the Earth. Another consequence of the rule of the State by the Party is the rejection or even repression of all efforts by social forces outside the Party to participate. This not only makes it hard for the Party to become the solution, it makes the Party the problem. The Communist Party of China with its over 80 million members is the largest political organization in the world. The Communist Party is the main force for reform and opening but it is not the only force. Ever since reform and opening began more than 30 years ago, Chinese social forces outside the Communist Party have developed to a certain extent. Conflicts between different interests in society have begun to appear. China is entering a period in which social contradictions manifest themselves more frequently. These various social forces are clearly putting the Party under pressure. But we should also be aware that these forces are also forcing the Communist Party to improve itself and motivating it not to become marginalized. The confidence of the ruling party cannot and should not be built on the oppression and restriction of other forces in society. As Engels once pointed out, social progress is due to the sum of the various forces in society. A good society must be the result of a contest that balances many different social forces, not one in which one party dominates and runs the show everywhere and in everyl domains. A civilized society should not be one which we must fight each other to the death but instead a society in which the various forces in society can get along rationally. Democracy is one of the core values of socialism. Democracy should not be just a slogan but also a spirit and most importantly the manner in which a system is arranged. The most fundamental manifestation of democracy is in a constitutional framework. The touchstone for democracy is whether the administrative power can be confined within a constitutional framework. We can say that the constitution is the lowest common denominator for our society. The constitution is a contract made according to the will of all members of society. It is the foundation for the governance of the state and for overall social stability. Once this lowest common denominator is in place, we can build a social community. A community needs the equal participation of all social forces. Other social organizations and forces in Chinese society that want to have a role in promoting social development should not be opposed, restricted or attacked. The participation of other social forces cannot lead to the dissolution of community. It can only make the community stronger and more stable. The participation of various social forces also means a sharing of responsibility. If the ruling party takes all responsibility onto itself, the will surely arrive when it is not up to that responsibility. It would not be good for China if there were to be nothing but the Communist Party — no other political forces, no development or activities of other social organizations. Long term co-existence, mutual supervision, sharing honors and trials together, and facing the tribulations of the world together as crew in one boat, we should not be limited to China’s eight “democratic party factions”. We should also permit, allow, support and encourage other normal social organizations to operate, develop and participate in politics within the scope stipulated in the constitution. Democratic politics is a new kind of politics that differs from autocracy. It replaces the bloody violence of the autocrat with the loud noise of election campaigns during which the people make their choices. “Counting people’s heads replaced smashing people’s heads”. Democracy tames power but does not seek power. Democracy puts power in a cage and does not let emerge at will to harm people. Power put in a cage is also safest for people who are in power because it eliminates their greatest threat – the possibility that some other violent force will replace them. This way political barbarism was put to an end and political civilization was born. This made it possible for the community to live peacefully in an enduring political order. Democracy is not about diminishing the system that exists today. It is about preserving the existing system. Alarmists warn rulers that democracy is so very bad and that if democracy is implemented they will lose their privileges, their interests will suffer etc. These view lack historical perspective and are unrealistic. This kind of advice can only make rulers more and more divorced from today’s trends. Only by implementing democracy will we be able to protect the liberty of citizens, ensure the peace and stability of the state, and achieve peace and tranquility in international affairs. Professor Tong Zhiwei believes that the ideas “implement a state ruled by law and build a socialist rule by law state” and the “ruling the state by the Party” are completely opposite methods for governing the state. Before reform and opening, the governance of the state was according to the “rule of state by the Party” model. After opening and reform began, China gradually moved towards “rule the state according to the law and build a socialist rule by law country”. Historically, the Communist Party of China first affirmed theoretically “rule the state according to the law and build a socialist rule by law state” was at the Fifteenth Congress of the Communist Party. This marked a fundamental innovation in the Communist Party’s management of the state. At the same time it was a flat out rejection of the “rule of the state by the Party” model of governance. After the Fifteenth Party Congress [1997 – 2002], the National People’s Congress  amended the PRC Constitution so that the fifth article of the PRC Constitution states “The People’s Republic of China governs the country according to law and makes it a socialist country under rule of law.” [Translator’s note: Citation is from the PRC National People’s Congress website at http://www.npc.gov.cn/englishnpc/Constitution/2007-11/15/content_1372963.htm ] Before the Constitution was revised, the Constitution of the Communist Party of China had already enunciated the principle that the Party must operate within the scope of the PRC Constitution and laws. Moreover, the form of the revision of the Party Constitution was controlling for revision that was later written into the PRC Constitution that China is a country governed by law and is building a socialist country ruled by law. Even before its revision, the fifth article of the PRC Constitution already reflected to a significant degree the requirement that the PRC be a state ruled according to law and was building a state ruled by law: The state upholds the uniformity and dignity of the socialist legal system. All state organs, the armed forces, all political parties and public organizations and all enterprises and undertakings must abide by the Constitution and the law. All acts in violation of the Constitution and the law must be investigated. No organization or individual may enjoy the privilege of being above the Constitution and the law. The two formulations, “rule the State by the Party” and “governing the country according to law and makes it a socialist country under rule of law” might be said to be compatible in some respects. Overall, however, there is a clear contradiction between them and so they are incompatible. “Ruling the state by the Party” is a classic formulation meaning that there is no distinction made between state organs and party organs, the funds of the state and of the party are not distinct, power is over-centralized, the party takes the place of the state (government), party power is substituted for the law etc. . All this is incompatible with the state “according to law and makes it a socialist country under rule of law”. For the state to truly “rule the country according to law and make it a socialist country under rule of law”, we would need to follow the PRC Constitution and the laws in order to clearly define the scope of Party power, the procedure for the exercise of party power, and separate the Party from the state in their legal relationships, organs, property, personnel etc. We cannot fly the flag of the state “governs the country according to law and makes it a socialist country under rule of law” while in fact we are “ruling the state by the Party”. Realistically, we realize that all new systems are born from old systems. In the new system there will certainly be some scars left over from the old system. The path chosen for reform is inevitably the product of history. The past not only conditions the creation of and changes in political systems and ideologies but also restricts the choices for reform we have at any given time. Disagreeing with rule of the state by the party does not mean that one is opposed to strengthening the leadership of the Communist Party. The leadership of a governing party is mainly characterized by the choice of political lines and policies, but there is also the selection of important cadres in organizations, recommendations, decisions, as well as in leadership in propaganda, and ideological work. This does not means that the party takes the place of state organs such as the organs of people’s power and administration, the courts, and the procuratorate. The leadership of the Communist Party is in the PRC Constitution and so this leadership must be excercised according to law. The Communist Party, through legislation and revision of laws, makes its will the will of the state and makes the laws define the scope of action of all members of society including the ruling party. Although there are party regulations that are outside the scope of the law, these party regulations apply only within the governing party itself. In an era of the rule of law, we must emphasize that the rules of behavior that apply throughout society, that is the legal system and the general rules of social behavior, constrains all members of a rule by law society. That includes members of the ruling party itself. The PRC is a constitutional state. A constitution suitable to the interests of the entire Chinese nation and capable of being implemented is the lowest common denominator that we are looking for. Recently there have been some news reports that government officials at their installation ceremony were swearing an oath to uphold the PRC Constitution. This is a good sign. Ending rule of the state by the Party is the beginning of rule of the state according to law with the constitution being the highest law. Putting power into a cage means that all forces in society, including the governing party itself, are subject to the authority of the PRC Constitution.